Just one of the exciting images of school learning spaces transformed. I’m not going to get into all of the 29 Design Patterns in this post. 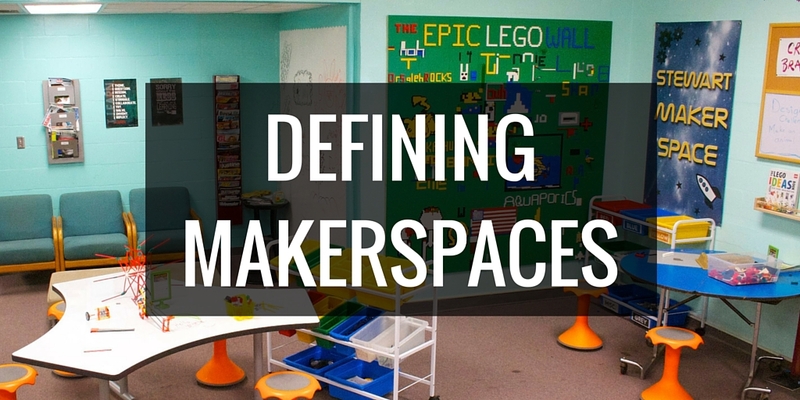 Instead, I want to highlight a few of my favorites and look at how they apply in library and makerspace settings. Some of the patterns I already see in my space. A Welcoming Entry – as soon as students enter our library, they’re greeted with a jet engine. Seriously. It helps to set the tone of the space right away. We also have a great deal of Student Display Space throughout our library and makerspace, where students can display their projects. We took over part of the trophy case in the hallway outside the library for this as well. I was familiar with the concept of Cave Spaces, Campfires and Watering Holes before reading this book. I’ve been gradually rearranging and reconfiguring much of our library space to help create these types of learning spaces for my students. Some of the patterns we don’t have yet in my space, such as natural daylight and homelike bathrooms. I’ve been advocating for changes like this, but unfortunately, they don’t seem likely unless I can get the district to do some major renovations. 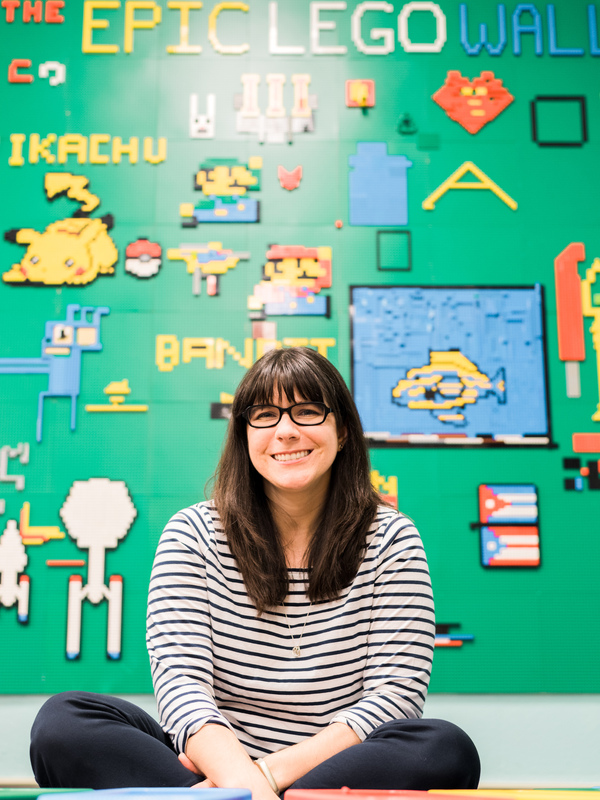 The Learning/Da Vinci Studio – An Ideal Library/Makerspace? Our most valuable export as a country will be creativity and innovation and these skills are not developed in the cells-and-bells model of school. This actually covers two separate design patterns in the book: Design Pattern 1: Principal Learning Areas, and Design Pattern 5: Science Labs, Art Studios, Life Skills Areas. In Design Pattern 1, a section focuses on the Learning Studio, a super flexible classroom space, often in the shape of a L, that allows for the space to be constantly shifted and changed depending on the focus. The space supports independent study, peer tutoring, team collaboration, lectures, project-based learning, etc. As I read this section, it struck me that libraries are already doing this. The concept of transforming a classroom into a similarly flexible space is powerful. I was also struck by the science lab section, as a Da Vinci studio is pretty much my ideal for a makerspace. It includes a science lab area, where chemistry and biology demonstrations can happen. It also includes a fine-arts studio and project-based learning area, as all these disciplines tend to intertwine. One of my favorite aspects of their ideal Da Vinci studio is access to an outdoor learning space, perfect for messy projects, tests of rubber band launchers, etc. There’s also presentation equipment, a great deal of storage space, and room for up to 24 students and one or two teachers at a time. The concept of Small Learning Communities runs throughout the book. The idea is to create smaller cohorts between 80 to 150 students. The small number allows students to get to know one another and prevents feelings of isolation. These students work in a sort of larger group area where there’s a great deal of self directed learning going on. A teaching team works with the students, sometimes one-on-one, sometimes teaching lessons to a larger group. The model is similar to the idea of a learning commons, except here, students spend the majority of their time in this space. At first, it sounds like it would be a logistical nightmare, but as the authors go into details about how such a space is run, you realize that this is an amazing, revolutionary approach to education. It really seems that such an approach would be AMAZING for students and would create so many more opportunities for students to discover and embrace their passions and express their voice. Such an approach would take larger, systemic change, but it doesn’t seem impossible. 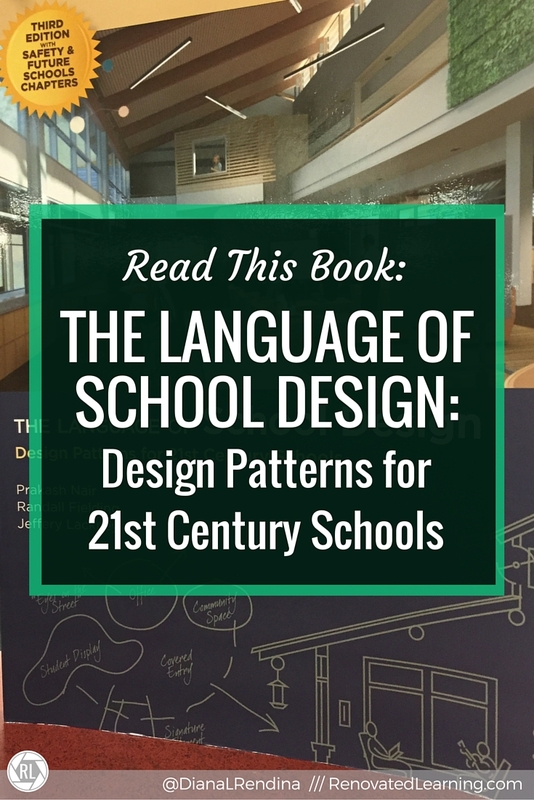 Many of the design patterns outlined in this book can be applied in some way no matter what your budget or current circumstances, and they offer ideas and inspiration for larger, school-wide transformations as well. This book is definitely a must-have for anyone interested in learning space design theory. Have you read The Language of School Design? What was your favorite design pattern?